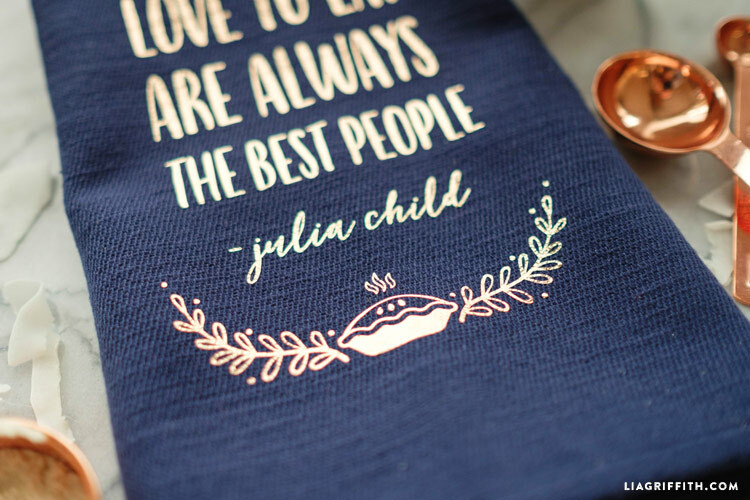 We love dreaming up new DIY hostess gifts, and customized tea towels are always a beautiful option. It is so easy to take something so simple and elevate it in a unique and personal way. Last year we created a holiday themed tea towel specifically to use for seasonal decorating, but our new DIY tea towel can be used all year round. 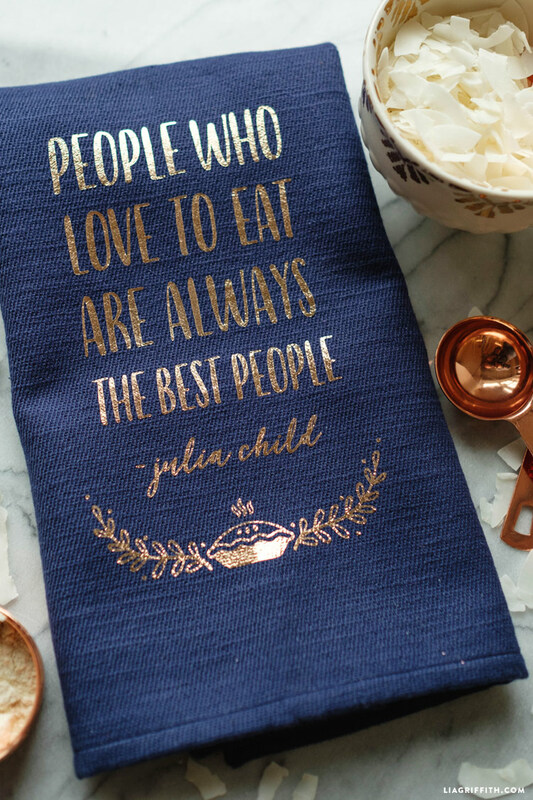 Julia Child is one of the most inspirational women in the kitchen, so it’s only fitting we would use some of that inspiration to create this cute kitchen accessory! This can also be a great opportunity to play around with color palettes to match your specific home decor. We love navy and warm metallic combinations, and they can be especially great for fall and winter. The towel we chose has a super rich shade of navy and it was something we found at our local West Elm. We then paired the navy with rose gold iron on from Cricut. Find the link for the foiled iron on in Shop this Project! Use the SVG download for our DIY tea towel design with your cutting machine, or download the PDF if you are cutting by hand. The PDF version comes with a few color options, and we mirrored the file for you so you can print as is. 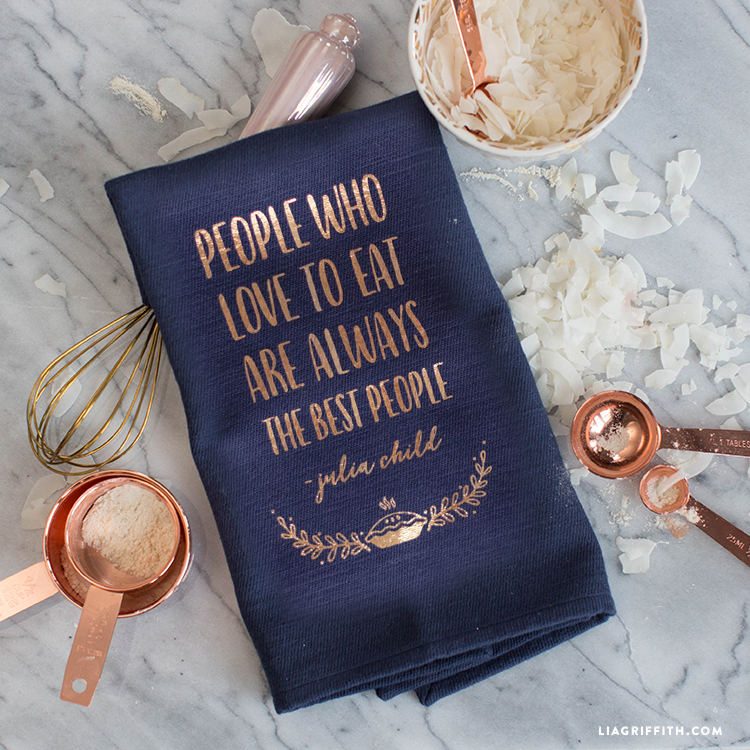 We also added a bonus download if you want to turn this whimsical quote into cute art print! it downloads as a zipped file… I try and upload in the cricut but it says the file is not supported… also had trouble with the candy huggers… am I doing something wrong? what brand vinyl do you use? I go pretty easy on these dish towels (mostly use them for decoration and wash occasionally), but have been pleasantly surprised that the iron-on stays on nicely after washing!